Get the latest updates on trends and issues impacting you and the accounting profession. 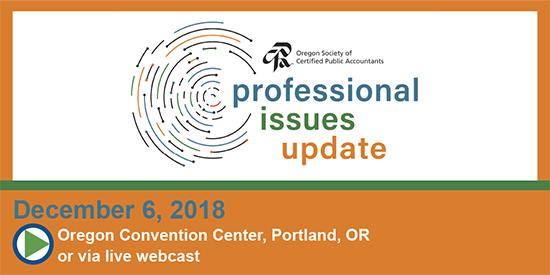 Join your colleagues at the OSCPA 2018 Professional Issues Update on Thursday, December 6. Attend in person or via live webcast. *Nonmember Full-Time Accounting Faculty & Students: Contact OSCPA to register and receive discounts at 503-641-7200 / 800-255-1470, ext. 3. Can't attend in person? Attend via live webcast on December 6! Register here. OSCPA members, non-members, college/university students, and full-time accounting faculty.